In the mid-'90s, I started doing research on the history of rock ’n’ roll music. My motivation was a 1996/1997 reunion album with the members of the group Journey (the album we made was called Trial By Fire). I wanted to have a better understanding of rock music so I could address playing my drum parts with a deeper understanding of the actual roots of rock drumming. I started by reading dozens of books on the history of U.S. Music: jazz, ragtime, blues, boogie woogie, country, bluegrass, folk, R&B, gospel and rock. While I read the books, I bought stacks of CDs so I could hear the music I was reading about. Many of the CDs had credits so it was clear who was playing drums on the recordings. But some of the songs I was listening to had no credits and no indication of who was playing drums. Being curious and wanting more insight - I needed to know! on the I'd Hit That podcast! I had to ask a lot of questions and do a lot of research to find out the names of the drummers that played on certain records. I was surprised to learn that the drummers that played on the early rock records were actually jazz drummers! I also started to notice many threads and connections between the various forms of U.S. music, the key point being: originally, they all shared the same rhythmic base: the swing pulse. After noticing this pattern, it finally dawned on me that in those early years of rock ’n’ roll, there were no drummers who had come of age listening to rock, nor did any grow up wanting to play rock. In the late '40s and early '50s there were, in fact, no rock drummers yet! Or, to be more precise, there were no drummers that identified themselves as rock drummers. This research became the foundation of my Hudson Music DVD Drumset Technique / History of the U.S. Beat. But, before we filmed that DVD in 2002, I had an idea to film interviews with the drummers that I had been reading about and listening to in order to make a documentary-style film about the early roots of rock drumming. It took me a lot of effort to learn about the music and the drummers that were involved in creating the music. I had come up with some of my own theories and hypotheses of how the drumming actually developed but I noticed there was no clear documentation from the drummers themselves. I wanted these drummers to tell us how they came up with the groundbreaking grooves and feels that we all take for granted today. I had discussions with Paul Siegel and Rob Wallis of Hudson Music about making a documentary-type DVD about the transition in music that occurred in the late ’40s/early ’50s - giving birth to rock ’n’ roll, and the largely unknown (and many times un-credited) drummers that developed early rock drumming. It was a story that hadn’t been told and we felt it would be interesting to the drumming community. Rob and Paul decided to go ahead with the project. I started by developing a template of questions to ask each drummer. This way, we could cut from one to another and have different drummers answer the same questions. The drummers could tell the story from various perspectives. Paul Siegel, Rob Wallis and I compiled interview footage from 2001 to 2003. I felt that the drummers were very open, honest and insightful. These drummers all found the process interesting; they were being interviewed by drummers, for a drum-oriented project, which made them dig in and answer questions that many hadn't been asked before. When we finally stepped back and looked at what we had, and started to begin the work of assembling a documentary, we found that it would be cost-prohibitive to make it the way we originally envisioned because of licensing fees (for historic video footage and song usage) and the editing time that would be involved. As we all got busy with other projects, The Roots Of Rock Drumming was put on hold. In 2012, we revisited the project. We settled on the idea of having the interviews transcribed and then edited for a book. Drummer/writer/historian Daniel Glass was engaged to edit the interviews and write an intro about each drummer. Daniel is extremely knowledgeable about the early years of rock ’n’ roll, and was highly motivated to take on the assignment. In fact, in the early 2000s, Daniel was conducting his own interviews with drummers from the early rock ’n’ roll era and some of his interviews have been incorporated into the book. The book succeeds on a number of levels: it’s interesting, entertaining and informative. 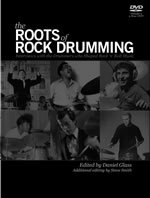 I believe all drummers can learn something of value by reading the book and watching the accompanying DVD where you can see and hear these drummers talking about the Roots of Rock Drumming.